TurboTop is a small program that sits in your System Tray. 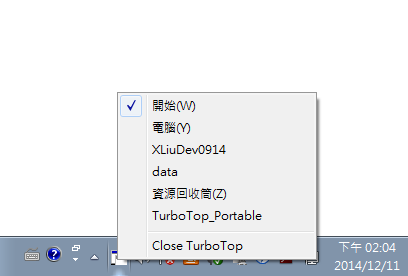 By clicking on the TurboTop icon, you'll be presented with a menu that displays all windows that are currently visible. Simply click on the menu item that corresponds to the window you want to make "Always on Top." The popup menu also shows which windows are currently "Always on Top" by displaying a check mark next to the name of the window. When you click on a checked menu item, TurboTop will make that window not "Always on Top."